We are often asked – “What Makes a Great Collision Repair Center”? Why is it that estimates from different body shops can sometimes vary wildly? One auto body shop might give you an estimate for $600 for a repair, while their neighbor down the street quotes $1,500 for the same repair. What’s the difference between the two shops and when does it make sense to go with the cheaper quote? 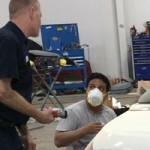 Hans Ryden, owner of Bavarian Body Works, in Atlanta, Georgia, explains the differences between Auto Body Repair Shops, and how to navigate through the decision process.. Hans has been an auto enthusiast his whole life. In his limited spare time, Hans races BMW’s as a member of a few of the locally sanctioned racing associations. Here are some of Hans’ tips for choosing the right auto body shop to fix your collision damaged car. It is easy these days to simply go online and do a search. You may, however, get different results, depending on the device that requested the information. A smartphone search will show the most local results. However, the best shop may be just a mile or two outside of the results from the search engine. It may be well worth going a couple of miles further to get the best service. The website should give you a look into who the owners are, how they present themselves and how effective they might be at communication. Check online reviews. Some businesses will solicit reviews from their customers. They may even pay a customer to write a favorable review. These are easy to detect. They are often gushing with superlatives that seem extreme. – Going to ABC company was the best decision I ever made…” Really? You may also need extremely negative reviews. These could be placed by a competitor, and are often extremely negative. A smart shop will respond to a negative objectively and openly. Sometimes things do go wrong in business. How the shop handles a negative situation can be a very positive attribute. Sometimes the problem with a collision repair has to do with the customer’s insurance company. Insurance companies try to control costs in order to maximize profits. That makes sense. However, not all parts manufacturers provide parts of the same quality. Hans will make sure that critical parts are used during the repair so that his customer’s family is safe once the car goes back on the road. Reviews that are in the middle of the two extremes are usually written by actual customers on their own volition. Technical expertise is obviously very important. Hans has some of Atlanta’s top auto repair technicians. These include frame experts, interior repair experts, paint specialists. He pays them well and treats them like family. Hans feels that it makes good business sense to find, train and retain the best talent possible. It creates a positive atmosphere and each team members feels a responsibility to the customer and to the team to deliver to the highest standards. Beyond the technical expertise, experience in dealing with insurance companies after a collision takes patience, discernment and resolve. Hans’ experience with insurance companies, parts vendors, and auto manufacturers means that his customer is well represented. When choosing a body shop, asking key questions will help you determine the right shop for your auto body repair. First, how long have they been in business? How long have their top technicians been active in their craft? What insurance carriers do you work with? Some customers realize at the wrong time that the cut-rate insurance they bought in 15 minutes may not cover certain types of repairs. How long will the process take? What could occur that would affect the delivery date? What is the likelihood that the delivery could be delayed? If you have any further question on what makes a great collision repair center, contact Hans Ryden at Bavarian Body Works. Ask the tough questions. For some people having a long-term relationship with a trusted auto body repair shop is as important as having a family doctor that they trust.